Located in El Dorado Ranch resort, this gorgeous and affordable San Felipe rental condo has over 1,900 square feet of living space, 3 bedrooms, three bathrooms, Sea of Cortez and swimming pool views, and a classy sophisticated style ambiance. El Dorado Ranch condos are designed, as a first-class residential resort. You will know you have arrived at El Dorado Ranch San Felipe at the main entrance to our resort as a cascading waterfall welcomes you. A first-class resort would not be complete without an 18-hole golf course, and the Las Caras de Mexico golf course is here for your use. As our guest, you are considered a resident of El Dorado Ranch and using the guest passes we provide you, you automatically get discounts on golf cart rentals and playing golf. While enjoying your game along the different holes on the course, you will be treated to a bit of Mexican history as every hole has the face of a different historical Mexican personality. 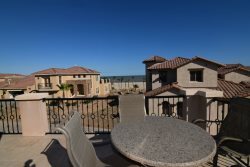 Compared to other neighboring resorts, El Dorado Ranch condos are never crowded or overly noisy. No wonder Los Angeles Times travel section and Tripadvisor.com voted El Dorado Ranch the #1 vacation resort in San Felipe, Baja California. It's simply an oasis of splendor. Vacation in this San Felipe rental condo and take advantage of the semi-private pool a few steps from the entrance - see picture. No unnecessarily worries about lounge chair availability or sun umbrella availability - there are lots of sun umbrellas and lounge chairs for your convenience. If you prefer a bigger pool with more activity, as our guest staying in San Felipe rental condo 36-3, we will provide you and 9 of your guests pool passes that give you access to the bigger La palapa pool also within our gated resort of El Dorado ranch. Getting to the La palapa pool is an easy walk across the golf course, just check that no golfers are in the vicinity. Or follow the well-manicured paths around the golf course and enjoy the different plant species native to San Felipe and Baja Norte, including the famous cardon cactus, and Prickly Pear or Nopal, as it is called in Spanish, as you make your way to the pool. The la palapa pool is an oasis of splendor in the heart of El Dorado Ranch resort. Many mornings, there is a game of water polo or water volleyball being played - you are welcome to join in the fun. 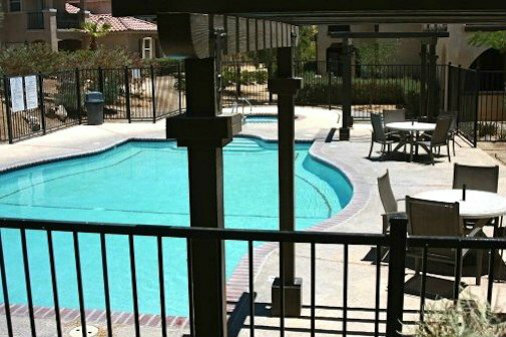 This swimming pool has an adjacent restaurant and bar - a popular hangout in our gated community for breakfast and lunch. Complimentary WiFi is provided by the restaurant, so go ahead and catch up on your email, or post some vacation pictures to Facebook, or Skype with friends and loved ones. The amenities and decor of this San Felipe rental condo are superior compared to other common San Felipe rentals. This privately owned, exceptionally decorated and professionally managed split-level rental condo, ensures a memorable vacation experience begins the moment you arrive. Facing in the direction of the sunset, filtered sun-rays light up the snow white colored living room with high ceilings, illuminating the striking decor that successfully crosses contemporary furnishings with a sprinkling of fanciful Mexican flair. High ceiling French windows, which can be partially opened on the lower sections of the window, create a complete open-air living ambiance. A powerful central air-condition unit is built into this San Felipe rental condo allowing you to set the perfect temperature for your enjoyment. It's hard to list all our favorite features in this San Felipe rental condo as they are too many to list, but they would have to include the kitchen island, fully stocked chefs kitchen, high-end stainless steel kitchen appliances; GE refrigerator with ice maker and vegetable storage preservation sections. GE electric range with 5 elements, one for warming and a self-cleaning oven perfect for grilling chicken or fish you may have caught while doing some fishing. Prefer BBQ grill to oven grilling? Then step outside onto the upstairs patio and light up the inbuilt gas powered BBQ grill. The convection microwave oven is right above the cooker. High quality pots and pans, cutlery, plates and glasses are more than enough for you and your guests. Coffee maker and toaster are also included. There are two living rooms; one the first floor and the other on the second floor, plus surround speakers throughout the house. Let's not forget the master bedroom with jetted bathtub and shower. Welcome to living royalty style. The very clear and unpolluted clouds over San Felipe makes star gazing a fun thing to do at night. It's simply remarkable how many stars you can see. The upstairs balcony is perfect for this. Designed with a rare patio fireplace, your comfort is guaranteed even on colder nights, when lounging on the upstairs patio, at night, zipping some margarita or any other of your favorite drinks. El Dorado Ranch is well known amongst Baja travelers in the know for its amenities, which in addition to those already listed include tennis courts and pickle courts. While two tennis courts are next to the la palapa pool, you will find more tennis courts and the pickle courts across the highway 5 in the extension of El Dorado Ranch. While there is no full gym in El Dorado ranch, there is a full gym, a short drive up the road where you can buy a day pass for as little as $3 a day. Come stay with us in this gorgeous San Felipe rental and enjoy the vacation of a lifetime.